Gale warnings have kept boat anglers off the Great Lakes. Strong wave action has made for dangerous conditions on the piers keeping those anglers on shore. When they can get out, fish are being caught. The Chinook runs are winding down and the remaining fish are deteriorating. Steelhead fishing will only get better. Lake Erie: With strong winds throughout the week, perch fishing tapered off with most boats getting 10-30 fish southeast of Stony Point in 26 feet or near the Dumping Grounds and the E-Buoy in 23 feet. A couple anglers found numbers and jumbo fish closer to shore when the bite slowed in deeper waters, specifically, in 15 feet off Toledo Beach Marina and in 16 feet in Brest Bay. Most were using emerald shiners on perch rigs with green, purple and chartreuse spinners and/or beads. Walleye anglers, as well as the walleye bite, continue to pick up with limit catches between Brest Bay Marina and Stony Point in 14 feet when trolling glitter minnow crank baits 40 feet back. Good bass fishing continued early morning along the Sterling seawall and canals, the Bolles Harbor and Toledo Beach Marina breakwaters, off Luna Pier and near the Hot Ponds with 20-50 largemouth and the odd smallmouth netted. Anglers were casting spinners, crank baits, chatter baits, tube baits or green pumpkin and watermelon worms. Most were caught between 8-10AM and the largest came from the backwaters at Bolles Harbor. Detroit River: Continues to produce some yellow perch for those using minnows on spreaders. Most were fishing around the islands in 10 to 15 feet or down near the mouth in 14 to 18 feet. Walleye were caught when trolling, jigging or hand-lining. Lake St. Clair: The lake has been exceptionally rough over the past week which has made fishing in the open waters quite difficult. Bass fishing was slower, but anglers were still catching both large and smallmouth along the shoreline surrounding Metro Beach and on Anchor Bay. Perch anglers anchored in front of the Fairhaven launch caught a fair number of fish and some large catfish. Perch were also caught outside the Clinton River Cut-Off. The bluegill anglers were doing well in the canals and small rivers running into the lake. The pike action was fair to good. Try near St. Johns Marsh or around the islands. St. Clair River: A couple walleye were picked up in the North Channel but anglers had to work hard for them. Large and smallmouth bass anglers were getting maybe two fish per trip. Lexington to Port Sanilac: Atlantic salmon are in the harbor at Lexington however they were not biting for the most part. Only one or two fish were caught daily. Walleye were caught from the breakwalls after midnight when casting spoons or body baits. At Port Sanilac, walleye were caught when casting outside the breakwalls. Harbor Beach: Was also producing walleye off the breakwalls. Port Austin: Walleye were caught starting around 1 a.m. when casting spoons and body baits off the breakwalls. Saginaw Bay: Had another poor week of fishing. When the weather improved, the fish did not cooperate. A few perch were caught off Linwood in 12 feet, between the Saganing and Pinconning Bars in 15 to 20 feet, near Spoils Island, the old shipping channel and the Spark Plug. A couple lucky anglers got limit catches eight to 10 miles out from Quanicassee however most had single digits only. Saginaw River: A few perch were caught near the old cement plant in Essexville. One decent catch of walleye was taken right at the mouth. St. Joseph: Fishing pressure was very low because of poor weather conditions. Gale force winds kept boats off the lake so no there are no trout, salmon or perch reports. Even though steelhead are in the area, pier fishing for them was slow. St. Joseph River: Has steelhead as fish have been spotted going through the fish ladder at the Berrien Spring Dam. Try spinners, spoons, flies, crawlers or eggs in the swift moving water. South Haven: No boats had been out because of the windy conditions. There are no perch reports. When they could get out, pier fishing was slow. Black River: Anglers were out trying but the steelhead fishing was slow. Kalamazoo River: Salmon are still being caught but most are turning quite dark. Steelhead were caught on spawn, small spoons, spinners and crawlers. Grand Haven: Windy conditions have kept boats off the lake. Pier fishing was too dangerous because of rough water. When they could get out, pier anglers were getting some coho on spawn bags. Grand River at Grand Rapids: Is still producing some coho up near the dam. Steelhead are moving in and a few more fish have been caught on real or artificial spawn, beads, egg pattern flies or spinners. Grand River at Lansing: A few coho have been caught near the North Lansing Dam and the Moore’s Park Dam. Smallmouth bass were taken on minnows, crawlers, spinners or twister tail grubs near the North Lansing Dam. Pike were hitting on green spinners. Morrison Lake: Anglers were still getting some bluegills. Try crickets or wax worms. Muskegon: When the weather allows, a couple small coho were caught by pier anglers. The steelhead action was slow. Whitehall: When they can get out, pier anglers still-fishing with spawn bags caught small coho and the occasional steelhead. Anglers casting jigs, blade baits and body baits caught walleye between the piers in the evening. White Lake: Anglers using dropper-rigs tipped with perch minnows or wax worms caught yellow perch in 30 to 40 feet. White River: Salmon fishing was good for those drifting skein or fly casting with egg pattern flies. Cheboygan River: Anglers caught lots of Chinook salmon with real and artificial spawn, skein, spoons and crank baits however skein and crank baits worked best. A couple steelhead and walleye were also caught. Ocqueoc River: Had some fishing pressure but no fish were harvested. Most were using real and artificial spawn or crank baits. Rumor has it a good number of Chinook were caught at the Ocqueoc Falls. Rogers City: Windy conditions made for rough water and very few anglers were able to get out. One angler that ventured out caught no fish. Alpena: Has had gale warnings and rough water in Thunder Bay and beyond making it difficult for boats to get out. Thunder Bay River: Anglers had been fishing mostly around the 9th Street Dam on both sides of the bridge. The Chinook are beginning to deteriorate so most of them are being thrown back. A few brown trout and Atlantic salmon have been caught. Anglers are casting body baits and spoons, drifting flies or floating spawn and beads under a bobber. Black River: Salmon anglers were casting spinners and spoons or still-fishing and floating spawn and skein at the mouth but fishing was very slow. Harrisville: Those targeting salmon were casting spoons, still-fishing with spawn or trolling J-plugs and body baits in the harbor but no fish were caught. A couple walleye were taken on crank baits in the evening from the harbor walls. Oscoda: Those trolling spoons, body baits and J-plugs around the piers had no luck. Pier anglers caught a couple walleye on jigs and body baits. Channel cats and freshwater drum were taken on crawlers. Au Sable River: A few Atlantic salmon were caught between the Whirlpool and Foote Dam by those drifting skein and streamer flies, or beads under a float. A couple Chinook were caught by those casting rapalas and swinging streamers. Most of the Chinook have been released as their condition is deteriorating. Small steelhead were taken by anglers floating or drifting spawn bags and beads on the gravel. Smallmouth bass were hitting on streamers and pike were hitting on large spinners. Tawas: The minnows have left the harbor. Fishing was still slow with only a few pike, catfish and smallmouth bass taken. Petoskey: Had no boat anglers and none were seen on the breakwall or at the end of the marina docks. Bear River: The water level has dropped some over the last week but was still flowing high and fast. Angler pressure was lower at the dam, but fish were still being caught. Most were getting mainly lake trout, Chinook, coho and a couple steelhead when drifting real and artificial spawn or using flies. Anglers reported a couple brown trout being caught but those fish must be released as the season is closed. Those fishing the mouth and between the bridges below the dam had good catches including a couple pink salmon. The Chinook and coho were turning dark. Charlevoix: Had no boat anglers and no one fishing near the cement plant. A couple anglers were trying for smallmouth bass in the channel but had no luck. Traverse City: Cisco fishing was good in the East Bay. Fish were caught along the West Bank, north and south of the launch and around Deepwater Point. Perch fishing was slow, but some nice smallmouth bass were caught in 25 to 35 feet. On the Elk River, a few lake trout were taken on spawn at the dam in the afternoon and into the evening hours. In the West Bay, perch fishing was slow in Sutton’s Bay and hit-or-miss in Bowers Harbor and south of Elmwood Marina. Fishing was slow on the Boardman River with only a few Chinook caught however the fish were dark. Platte River: Still had some coho and Chinook. The Chinook are fun to catch but most are being released as they were in bad shape. Frankfort: Steelhead have started to move in around the piers and along the shore line. The bite was best after 9 a.m. when using fresh spawn. A few small coho were caught off the piers. Betsie River: Chinook salmon were reported at the Homestead Dam but they are spawned out and deteriorating. Portage Lake: Perch fishing was starting to pick up out in front of the city launch. The fish were hitting on minnows, red worms and wax worms in 18 to 22 feet. Manistee: Surface temperature readings were about 52 degrees. The restrooms and the fish cleaning station are now closed and the docks are starting to get pulled. Pier fishing was starting to heat up with steelhead taken on spawn. Some whitefish were taken by those using spawn off the north pier. Manistee River: The Chinook salmon are on the downswing. There are still plenty around, but they are dark and actively spawning. Anglers caught small steelhead and a couple Atlantics while drifting or floating beads, spawn, and skein right behind the spawning Chinook. The steelhead seem to be actively feeding on anything egg-like. The Atlantics appear to be waiting for their turn on the gravel, occasionally grabbing whatever the current brings by including eggs, streamers and spinners. Big Sable River: A good number of coho remain between the foot bridge and the dam. More anglers are starting to catch them using thunder sticks, Cleo’s and spinners. Ludington: City workers are starting to pull docks and will be closing the restrooms and the fish cleaning station soon. When the weather allows, steelhead and a small number of coho were caught off both piers by those using spawn. Pere Marquette River: The Chinook salmon run is just about done. The remaining fish are now spawning and will deteriorate rapidly. Anglers will find some coho along with a fair to good number of steelhead. Pentwater: Strong winds have limited fishing opportunities, but pier anglers still-fishing with spawn caught the occasional steelhead or coho in the early morning. Pentwater Lake: Anglers using small jigs or dropper-rigs tipped with perch minnows caught yellow perch in 20 to 30 feet. Pentwater River: Those drifting skein or spawn bags continue to catch salmon throughout the river. Try the deep holes in the early morning. Lac Vieux Desert: A hard cold spell dropped the water temperature by 10 degrees which slowed fishing activity. A few muskie were caught by those trolling or drifting suckers however it was difficult to get the fish to bite. No bass or walleye anglers and the panfish anglers were few and far between. Those targeting pike did well when jigging the bottom with red tails. Marquette: All the recent rain has the rivers running high and stained with lots of debris floating downstream which makes fishing very difficult. When they can get out, boat anglers looking to take that last trip were trolling in front of the Chocolay and Carp Rivers, just outside the Lower Harbor in 50 feet or less and slightly north near the white rocks. Most boats had at least two fish consisting of lake trout, brown trout, Chinook and coho salmon. A few lake trout were caught off the Lower Harbor breakwall. As the water continues to cool and the fish come in shallow to spawn, shore and river anglers should see more action. Little Bay De Noc: Water temperatures were in the low 50’s to high 60’s. Walleye anglers reported fair catches mostly in the southern waters. The hot spots were the southern end of the “Black Bottom” when trolling stick baits in 15 to 30 feet or the just south of the Ford River near the “Fingers” in 18 to 22 feet. Several good perch catches were reported in the Kipling area and north to the Day’s River with minnows or crawlers in 17 to 35 feet. Fair smallmouth action out deeper in 18 to 30 feet. Most were casting or drifting plastics on drop-shot rigs. Big Bay De Noc: Walleye anglers were trolling stick baits between St. Vital Island and Round Island, but no fish were caught. Fair to good perch catches in Garden Bay with minnows in 35 to 40 feet near the mouth of the bay. Good smallmouth action around Snake Island and near Snail Shell Harbor with minnows along the break in 25 to 40 feet. Au Train: Fishing pressure was virtually nonexistent with the rain and brutal winds. A few anglers tried casting from the rocks but had no success as they were not able to land any fish. Munising: Heavy rain and strong winds caused flooding and many rivers were high and turbid. Boat anglers heading out reported very slow fishing with only one coho taken. Poor fishing was reported by shore anglers. There had been no major runs reported. Grand Marais: Heavy rain coupled with windy conditions limited fishing. Rivers in the area including the Sucker River were extremely high. Two Hearted River: Following heavy rain all last week, the river is well above average for this time of year. These high flows are creating difficult fishing conditions for catching salmon. Fish are in the river and catch rates should pick up as the water comes down. Detour: There was no fishing effort for Atlantic or Chinook salmon at the Detour Lighthouse. Those that want to target them may still find some young fish around Fry Pan Island and the green buoy just north of the lighthouse. Walleye have been caught up the St. Marys River including around Pipe Island and at Swedes Point. Try shiners with slip-bobbers set at 10 to 12 feet down along the underwater humps. For walleye, try near the mouth of Carlton Creek which is two miles south of the Raber launch when trolling a bottom bouncer and crawler harness with purple smiley blades just off the weed beds in six to 10 feet. Cedarville and Hessel: The pike action off Cedarville was fair in Snows Channel and Musky Bay. Try trolling crank baits in eight to 12 feet at the Middle Entrance and between Sand Bay and Peck Bay. A few yellow perch were caught by those drifting worms or shiners from Conners Point to Urie Bay or in 12 to 18 feet between Island Number 8 and Government Island. At Hessel, perch anglers were trying in the Hessel Marina, but no fish had been caught. Some splake were caught from the marina and finger docks however splake season is closed. 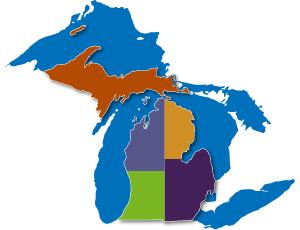 There are more than 11,000 lakes in Michigan – and the DNR has maps for 2,700 of them! These maps can help with inland lake fishing efforts and highlight shore features, vegetation and other water body specifics. These maps assist anglers in locating waters that contain trout and salmon and the regulations that apply to those waters.